The name ‘Kysty Land’ is unknown in Baslow today. However it used to be the name of the property now known as the Prince of Wales Inn, or more recently “Rowley's”. This document describes the history of the property from 1700 to 1900, and of the people who owned and lived there. My (David's) information is from previous owners, the Baslow Censuses and the Baslow Tithe Award of 1846. Samuel White, probably of the present day Home Farm in Church Street, bought the property some years later, as he mentions its acquisition in his will. At the time, the property was known as Kysty Land and is described in these early documents as “ A Messuage (House) with a Barn at the west end and Workshops at the east end with a Yard on the east side of the Chappell Yard”. On the south side there was an open space between the buildings and the Duke of Rutland's “Garden Land”, now the new burial ground. In 1741 Joshua Gregory discharged a debt to Samuel White (deceased) by paying £57 confirming his ownership of the property. He had probably bought it earlier and mortgaged it. to Joseph his son - The house next to road - converted from the barn mentioned above. To Christopher and James - the Farm Tenancy, subject to the will of Duke of Rutland. Joseph moved to London in 1792 to set up as a Carpenter, Dealer and Chapman making household furniture. In 1801 he was declared bankrupt owing £100. However he was discharged 2 years later. His house was then in trust for his only daughter Ann and her husband Charles Cox, a Drug Grinder of Clerkenwell in Middlesex. Perhaps Mr Cox had paid off his debts. They had one son, John Cox, and two grandchildren William and Richard who eventually inherited the House. Ann outlived her husband Charles who died in 1807 and remarried William Dawkins a Post Office Messenger. She died a widow in 1836 with no further children. In the Inclosure award of 1824, extra land was awarded to property owners: Ann Dawkins acquired a small plot north of her house next to the road. In the 1900s the village mortuary was on this plot, before it was demolished and the land reverted to churchyard. Meanwhile the House was leased out. John Gardom, a Shoemaker was tenant in 1801. In 1825 Robert Davidson was the lessee subletting it to Charles Morton and Joseph Barker. In 1848 Samuel Buxton, Grocer and Ostler was using it as a shop. Later Buxton shared it with his son in law James Hearnshaw a Butcher: and it was described as a Butcher's shop in documents dated 1860 and in the 1861 Census. Hearnshaw moved to new premises in Nether End later on in the year. Christopher (b.1752 d.1832) remained a bachelor and ran the farm. He left all his property to Joseph. By 1824 Joseph (the younger) owned both cottages and the workshops living in one of the cottages, and renting the other out, first to John Adlington and later to his eldest son John Gregory (b 1812) a Wheelwright. In the Inclosure Award he lost a small plot beyond the workshops (a. in the diagram and now part of the car park for the Church Rooms) to the Curate who put a building on it, and gained a strip of land to the north of the properties which some time after 1900 reverted to Churchyard. In the Tithe award of 1848, Joseph and his son John were occupying the premises, no doubt using the Workshops for their Carpentry and Wheelwright businesses. In 1855 shortly before Joseph's death, the middle cottages and workshops were sold for £240 to James Hawley a Cordwainer (shoemaker) from Great Longstone and his brother in law William Marsden another Cordwainer. The conveyance describes the property as (i) two cottages, situated in the present car park adjacent to the Churchyard and now demolished, (ii) a “Tenement” used as a joiners shop with contiguous Barn Stables and Outhouses - probably the old buildings at the far end of the car park, (iii) a Garden between the cottages and the modern burial ground, and finally (iv) the strip of land to the north acquired in the Inclosure Award and now part of the (old) Graveyard. In the next few years it is likely that James Hawley and William Marsden pursued their occupations as Cordwainers. 1860 saw the death of John Cox, the owner of the house next to the road. His sons William and Richard promptly sold it to Hawley and Marsden. James Hawley had great plans at the time. In the 1861 Census he is described as Cordwainer and the Innkeeper of the Prince of Wales Inn. In 1862 he bought out William Marsden and promptly increased the mortgage by £300, probable renovating his newly acquired building to its present configuration. By 1897 William M. must have sold the property as the Brampton Brewery took out a Mortgage for £2000 in 1897. He carried on as Licensee. In February 1900 the Inn and 3 cottages were valued at £3500 and Licence an additional £500. The document confirms that William M. Hawley was still in the inn and the cottages occupied by John Shipton a Postman, George Sabey a Baker and a Mr Derbyshire. However the Census confirms that by 1901 he had gone and the new tenant was Henry Ransall, a Licensed Victualler. William M. Hawley moved on to be the Licensee at the Rawson's Arms in Little Bakewell, previously run by his brother Arthur Vernon Hawley. In 1907 he took over at the Wheatsheaf in Bakewell following the death of his cousin Walter Hawley. He died in 1918 but the business was carried on by his wife Mary until she passed it on in 1924 to her daughter Fanny and son-in-law Frederick William Wilson. Subsequently there have been several Publicans at the Prince of Wales, lately including Bill Freeman and Bernard Shaw. The two middle cottages have been taken down and the third at the far end has been downgraded to outbuildings. 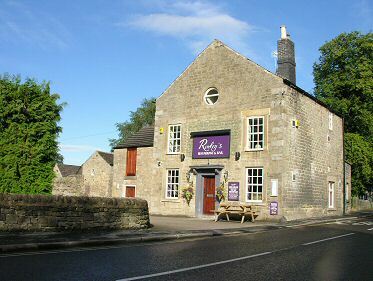 In 2006 the new owner changed the name to Rowley's, but it carries on as a Restaurant. And the original name of Kysty Land has been completely forgotten. The above information was contributed by David Dalrymple-Smith in November 2006.